Deep Purple History: It was here that Deep Purple's managers set up their offices. The Details: When Deep Purple began to take off, their managers sought a new office, and as they had both had offices in the street (Edwards running a wholesale clothing company, Coletta an advertising agency), settled on 25 Newman Street in the early seventies. This also became the office of Purple Records. Most band meetings were held here, and press interviews and photo calls were also often given here (including for example the announcement of Glenn Hughes joining the group). Eventually the entire building was used, with reception on the ground floor. 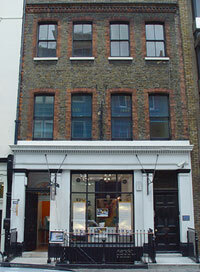 After the split in 1976 the building housed Oyster Records for a time. Eventually Tony Edwards moved out to set up Safari Records elsewhere, while John Coletta stayed and established Seabreeze, who managed Whitesnake. Today: The street is mainly occupied by media related companies, and when this picture was taken in 2004, the ground floor was a digital printing outlet, the offices above occupied by a financial company. Getting there: Newman Street is the third right turn off Oxford Street if you approach from Tottenham Court Road tube station.